After much debate as to where he would sign, Sergei Kostitsyn as chosen to join up with Avangard Omsk of the KHL. SK74 has been vocal about signing with the KHL, but he seemed to take his time selecting which team he’d settle with. As we mentioned in a previous post, the Predators forward has been pretty open about sticking with the KHL, even if the lockout comes to an end before the NHL season can be completely wiped. Of course, contract-wise, SK74 cannot technically do that, but with big names like Ovechkin and Semin claiming to do the same, it’s no surprise the younger Kostitsyn would jump on board with the bandwagon. Plus, with a league that jumps to a lockout with a drop of the hat, we’d probably do the same. As you remember, older brother Andrei Kostitsyn signed with Traktor Chelyabinsk in September after being dismissed from the Nashville Predators due to a late night stint during the 2012 playoffs with Russian rebel, Alexander Radoluv. Though most would think SK74 would join up with AK46 again, he chose to go at it alone, with Chelyabinsk a good 12 hours West of Omsk. 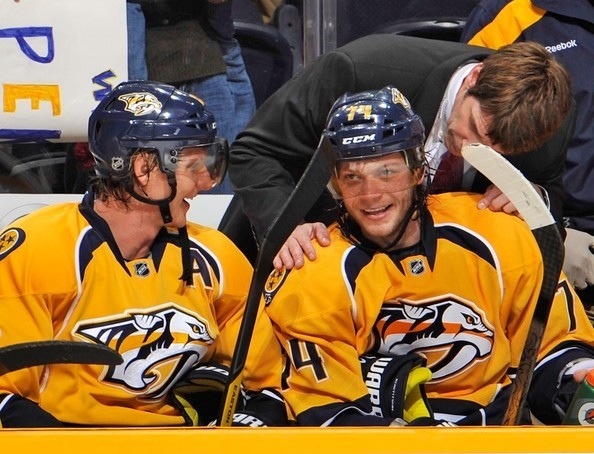 Sergei is now the fifth Nashville Predator to ship off to Europe, with Pekka Rinne teaming up with Dinamo Minsk, Roman Josi joining his former team SC Bern, Patric Hörnqvist signing with HC Red Ice, and Craig Smith joining Finland’s SM-Liiga.